For an overview of all the local grassroot projects carried within the Pride in Sport project, please see the Best Practice guide. You may download a copy of it in PDF format, or view it online below. LGBT sport is the key theme, with most projects run by LGBT sports groups. There are many positives to LGBT people engaging in LGBT sports groups. Firstly, LGBT sports groups provide safe places for LGBT people to be themselves and to explore their sexual identity. Linked to this, sports groups can enable LGBT people to grow in confidence about their sexual orientation and to become proud of who they are. Secondly, LGBT sports groups provide a place for LGBT people to return to or to get involved in playing sports, when many people have been put off sports at a young age due to the prevalence of homophobia/transphobia in mainstream sport. Thirdly, LGBT sports groups can play a role in developing the consciousness of LGBT people to become active citizens and to petition for their rights. Lastly, LGBT sports groups can provide a positive example to society of LGBT people – challenging stereotypes and taboos – by engaging with sports federations, political authorities and mainstream sports clubs. 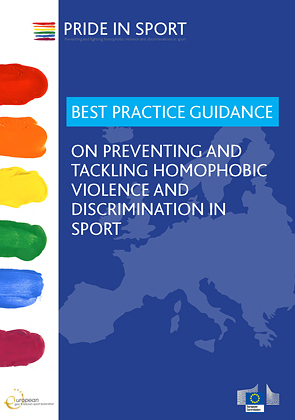 In all of these ways and more, the projects in this guide are positive examples of how resourcing, promoting and representing LGBT sport can have a positive impact in terms of fighting homophobic violence and discrimination in sport. The guidance concludes with recommendations from each context in the hope that this contextualisation of projects, guidance and suggested next steps will provide a useful framework for implementing further strategies and programmes in a way that is tailored to the specific needs of groups and individuals operating in different geographic and political spaces.